Your body balance is a direct reflection of your balance in all things in your life. Your body is the physical manifestation of your inner self – who you are. Healing of the body-mind-soul comes with understanding of your balance in your body and therefore your balance in all things in your life. The goal of bodily health and posture is to keep your body in a neutral, relaxed position whenever possible. If you do everything with ease and with the minimal effort required, you live and move in harmony. In order to do this you need to come to an understanding of where your body is in space. You need to focus on how you move, how you balance yourself and position yourself in relation to space. Maintaining your body balance through balance training as you age is extremely important. No matter how old you are, to find physical balance affects all you do. Maintaining your body balance will help you prevent all types of injuries as you move through life. The body performs best, and has less knee pain and back pain and all types of pain, when your muscles are uniformly fit and balanced. If you notice that you have bodily pain, most likely it is because your balance is out of kilter. You can improve your balance and your posture through intuitive movement. I intuitively prefer foam rolling, the balance training and Yoga positions but you can do many different exercises to improve your balance and your fitness. Go where your own intuition leads you. The balance in the body is a metaphor for life balance and work-life balance that includes time for you and you only. The single most common thread I see in people’s lives is the lack of work-life balance. In order to afford the things you believe you deserve to have you choose to work hours that completely disregard the most important thing in your life – your relationships to yourself and to others. As a result everything becomes out of whack. Your personal health suffers, relationships suffer and your financial health suffers as you strive for more and more material things that you believe will bring you satisfaction. At what cost do you continue to pursue this madness? At what point do you give in and say, “My life is out of balance?” How ill do you need to become for you to make a decision to find a better balance in your life? You need to get your own personal balance in line and take care of your own self, your own body-mind-soul before you can effect the lives of others. Balance also means including activities that involve play and pleasure. 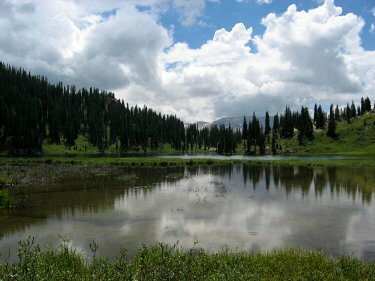 It includes time for reflection, meditation, centered prayer, physical activity and all things of the body-mind-soul. When you work on your body balance, meditate on the balance in your life! Repeat the positive affirmation for health: I am balanced in all things body, mind and soul! Yoga positions are a great way to get a feel for body balance and your position in space. Yoga postures are the best balance exercises. As you become aware of your body position, you will slowly learn to sense, if you pay attention, that just the slight shift of your body weight changes your body balance, changes how you use a particular muscle, and changes your focus. In Yoga, just when you thought you couldn’t hold a pose, if you moved a certain way, even if it was only a slight shift, it suddenly became more comfortable and the effort lessened. Using these shifts to re-group, and re-sense your position in space is a body self-awareness experience that reorganizes and retrains your muscles and nerves. This neuromuscular education is very important in understanding your body and becoming more balanced. This is a metaphor for the changes you will also feel in your body-mind-soul. By working on your body, you care for your soul. In the sport of rock climbing your sense of yourself in space is extremely important. It is about a continual re-shifting of your weight, to find a new body balance, a new approach to the next move. As you find this new balance, the effort is lessened, and you feel as if you could stand on that itsy bitsy lip of rock all day long. Rock climbing is a wonderful way to do balance exercises. I would highly recommend rock climbing as balance exercises for people of all ages. It is not just a sport for young, male daredevils. I am living proof of that! What you will learn about yourself in this sport is extremely rewarding. Rock climbing and mountain climbing, for me is a metaphor for life. The mental shifting to find new balance and conquering your fears are only a few of the metaphors one can think of. Climbing also gets me moving, gets me outdoors and keeps me young, even if only young at heart! If you prefer, going to indoor rock climbing gyms is a way to do balance exercises. You can keep your new knowledge of your body balance going all year long. Try not to be intimidated or embarrassed by all the testosterone and bravado you will see around you. Make the sport be your journey and from your heart - as is true with all meditative and intuitive movement. Gym climbing is a much easier way to start the sport. Plus there are experts there to teach you. As you discover these small changes in body balance, it is indeed an enlightening feeling. You wonder, ‘Why didn’t I get this before? Why didn’t I feel this all along?’ It was because you didn’t take the time to notice. You needed to educate yourself, or re-educate yourself on how to move most effectively and with the most balance, with your body in relation to space. This is true body self-awareness. If you really want to up your awareness of yourself in space through balance exercises, just close your eyes when doing a Yoga pose, like this modified Dancer's Pose, above. The pose now becomes more than twice as hard. For those of us less coordinated, just stand on one leg, then close your eyes, and see if you don’t wobble. Practice this movement on one leg, then the other. Even the difference in the two sides is pretty amazing. You can discover just how unbalanced you are. Work on the side that is weaker, to obtain better body balance. Meditate on what the metaphor for your life may be. 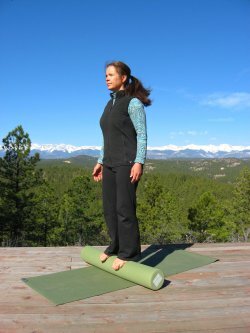 Another one of my favorite balance exercises is using the foam roller for better body balance. Just place the roller on the floor. First try to stand on it with two feet, to balance without falling over (see photo below). Then work on one foot at a time. It’s tricky, so be careful! Use a wall to lean against at first until you get it. Once you master one foot, try to slowly bring your back leg up and your opposite arm up. The movement is like you are going into a modified Dancer’s Yoga pose, but you don’t go that far, only as far as you can keep your balance. One arm is up and the opposite foot is back. Please have a spotter before you try to do this. Any foam rolling exercise will help you work on your body balance, not just standing on it, which is the hardest! It takes body balance to roll around on the floor on a foam roller and any one of the foam rolling exercises is balance exercises. Any Yoga pose will help you improve your body balance as well. The standing ones are the more important ones for balance and constitute the best balance exercises. 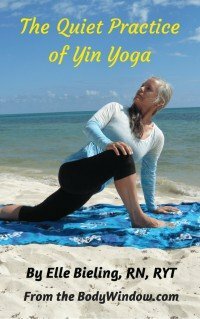 If you are new to Yoga and stretching, anything done on the floor is more supportive at first, and a good place to start before you move on to the standing balance exercises. The benefits of Yoga, foam rolling, working on the Bosu Balance Trainer and most body awareness exercises are improved flexibility, improved balance and posture, improved strength and overall improvement of the body-mind-soul! Use this information to further explore the metaphor of your balance in life. You will be astounded at what you discover about yourself. The right side of the brain controls the left side of the body and vice versa. Are you more right-brained (balance better on your left side) or left-brained (balance better on your right side)? Meditate on what this might mean for you in your life based on the following information. Studies show that children access their right brains much more before they go to school and are much more creative. When they enter school, a much higher value is placed on reason, math, and language and the left-brain skills become dominant. This is why we need to access our bodies to re-discover our true inner selves. It takes the right brain to access the body’s sensations and it’s special perceptions. It has been said that by the time we are adults, and have been totally acculturated by our education system, that only a mere 2% of us remain highly creative! I am more body balanced when standing on my left side and my ski turns are better when I am using the downhill ski on the left (making a right turn). It was an interesting discovery for me, because I always assumed that I was stronger in all aspects, using my left-brain or rational side. I guess that is what I wanted to believe. As it turned out, I was much more intuitive, or right-brain-dominant than I first supposed! Now I only wish I could use my left hand more. I hope to develop that skill as well. Body balance exercises are the most difficult to master. Just like in life, finding balance eludes us. It involves the body, the mind and the soul. The mind has to make the decision, the commitment to choose to make the balance. The heart and soul has to want it more than anything else! And with practice, the body will follow. The tissue is changed by the overwhelming desire to make the change, to create the space and create the balance. I am balanced in all things body, mind and soul!